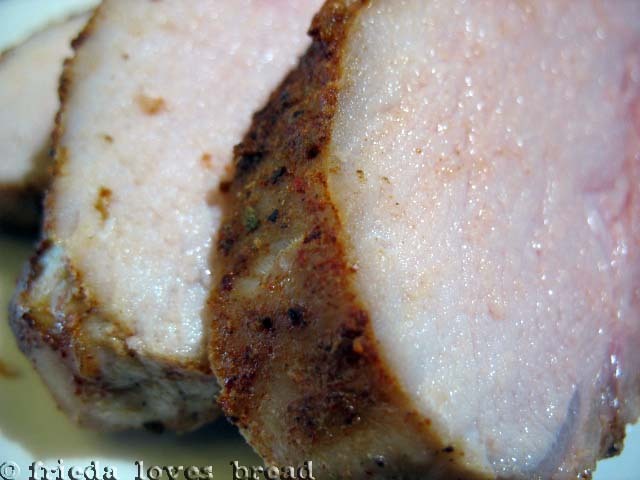 Frieda Loves Bread: Dry Rub Pork Tenderloin: A Tasty Kitchen Recipe! 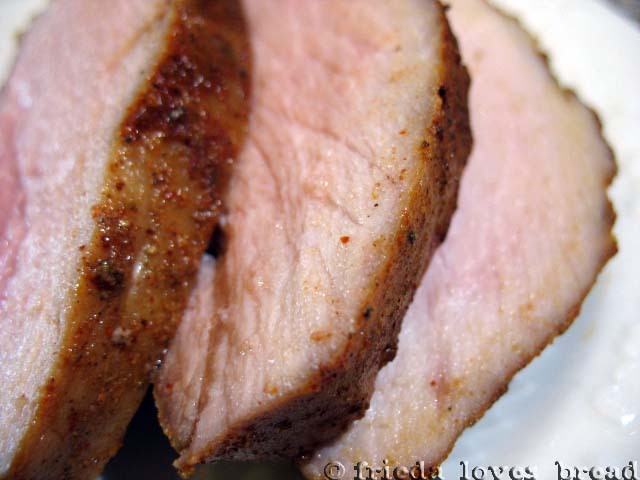 13 Dry Rub Pork Tenderloin: A Tasty Kitchen Recipe! If you haven't been following Ree of Pioneer Woman Cooks, you need to stop reading this post and visit her site. Pronto. I have been reading her blog ever since my sister-in-law introduced me to her cooking and was sucked in....not just from the recipes, but from her romantic love story of meeting her cowboy husband and becoming a ranch wife. Have you heard of Tasty Kitchen? It is the brainchild of Ree, who wanted a place for anyone to share, gather, and store recipes. It's almost like a FaceBook for folks who love to cook, bake, and yes, eat! Not only do you get to meet people from all over the country (and some parts of the world), you get to see some of their favorite recipes, some of which have been handed down from generation to generation. Cool, huh? 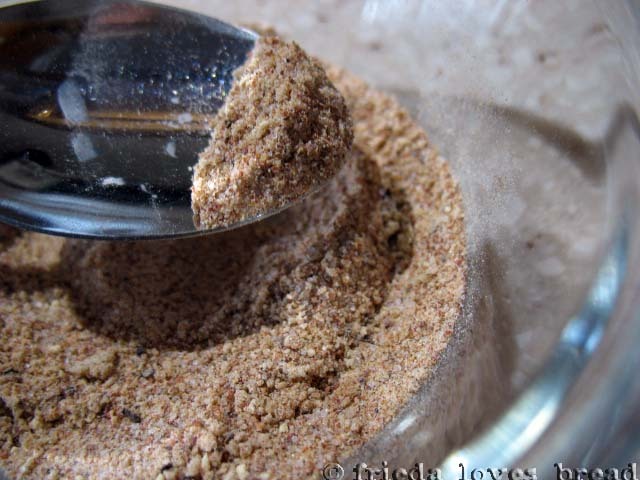 I stumbled upon this Dry Rub for Pork Tenderloin recipe that had great reviews from other TK members. Scroll down to the bottom of the recipe page and read all the reviews. Fantastic, huh? After reading the reviews, I knew I just HAD to make it. This dry rub is a mixture of spices: salt, pepper, seasoning salt, poultry seasoning, onion powder, garlic powder, chili powder and cayenne. It has a smidge of brown sugar for sweetness. 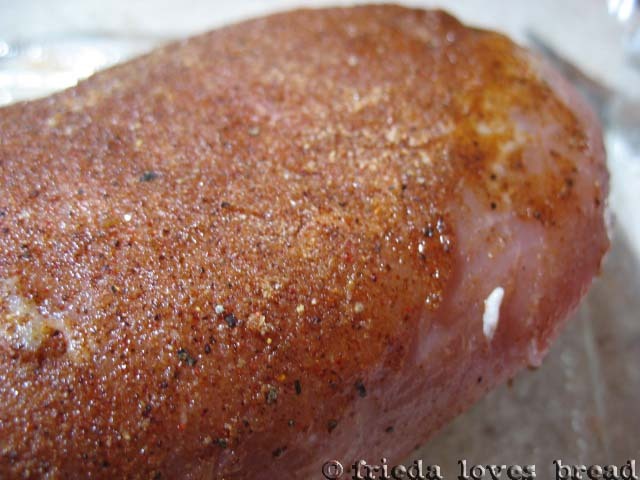 Put the meat in a glass dish and sprinkle ALL of the dry rub on every inch of your pork. I used the spoon to sprinkle it on and the back of the spoon to "rub" it in. Cover the dish with plastic wrap and let it marinate in the fridge for 30 minutes or if you're busy, an hour. Let the meat sit out at room temperature for an hour. I know it sounds weird to have raw food sitting out, but this will help your meat cook more evenly. The original recipe says to cook it on the grill, but there was snow outside....yes, it was late April and we got snow... six inches the wet, white stuff. I put the meat on a cooling rack over a foil covered pan, baked it at 450ºF for 25 minutes. Check the temperature. You want at least an internal temp of 135º-140ºF. Cover the meat with foil and let it rest for 15 minutes. The internal temp of the meat will go up and the juices will be redistributed throughout the meat. Cut some thick slices...look at that crust! See how tender and juicy it is? I was worried about the spicy level as I can't tolerate a lot of heat, but man, oh man, this was good! Just right. I wouldn't change a thing. 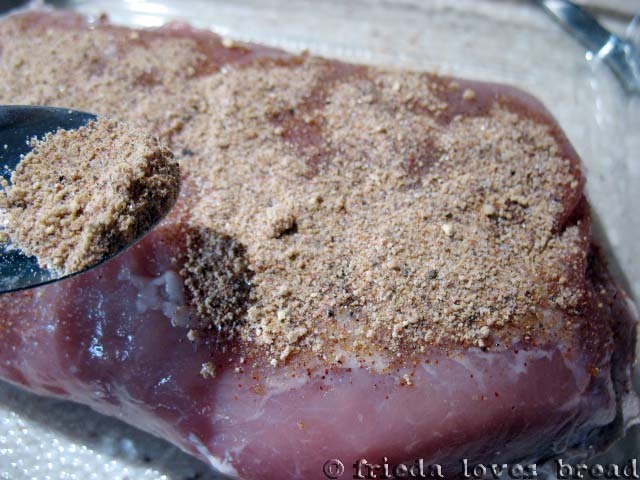 Create your own spice rub for the moist tenderloin. Tenderloin is smaller than pork loin and uses a shorter cook time. You can bake or grill your meat for ultimate flavor. 1. 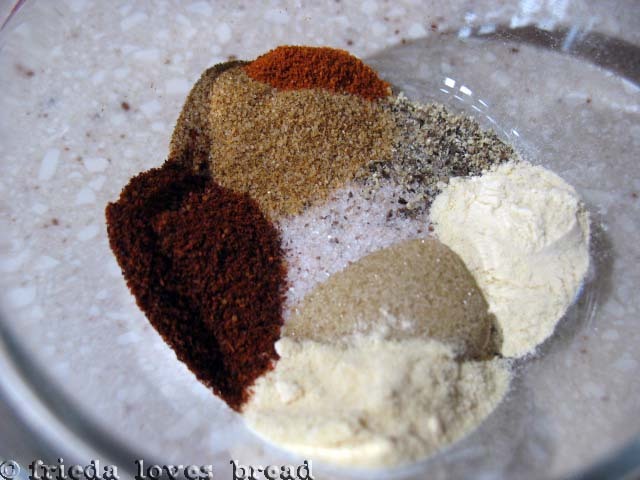 Mix together all the dry seasonings. 2. Sprinkle seasoning over tenderloins, rubbing on all sides. 3. Cover, let marinate in the fridge for 30-60 minutes.4. Bring meat out at room temperature for an hour. This will help the meat cook evenly.5. Bake: Put meat on a broiling pan or wire rack set over a baking sheet. 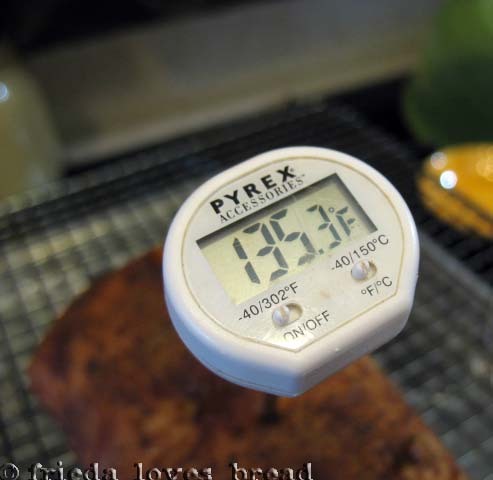 Bake at 450°F for 20-25 minutes until thermometer reads 140°F internal temperature.Grill: Covered, over medium heat until a thermometer reads 140°F, for 20-25 minutes, turning occasionally.6. Remove meat from oven or grill. 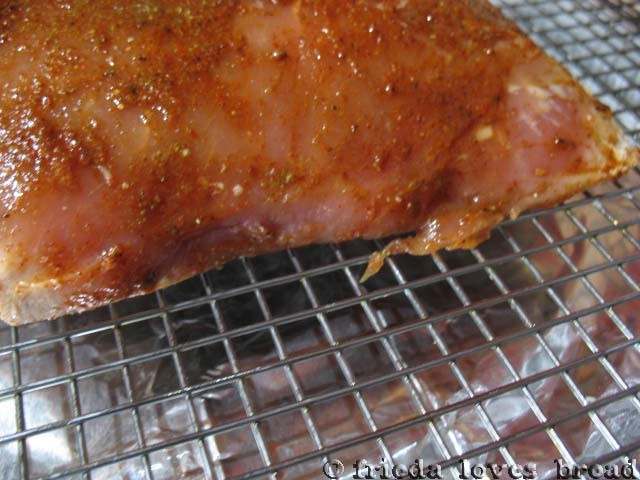 Cover meat with aluminum foil and allow it to rest for 15 minutes. The temp of the meat will go up to 145°F.Slice, serve & enjoy! *You can halve the rub and use one (1 lb) pork tenderloin. I always enjoy a good spice rub although I might dial down the heat just a bit! Thanks for sharing. Oooh! This looks delicious! THanks for sharing! I am addicited to tasty kitchen! I think I have 40 pages of community recipes to try!!!! MMmmm, that looks great. I've seen that recipe on Tasty Kitchen, I guess I will have to try it! Rivki, this recips is for 2 one pound pork tenderloins. I halved the recipe and used it for one tenderloin, using 1/2 t. of chili powder and 1/8 t. of cayenne. You can try the recipe by elminating the cayenne and see how it works for you. Oh, man. I love Tasty Kitchen! And Ree's blog is just too funny...I love reading her posts. Love this site. So many good recipes. I am going to try the spice rub. I like the heat! Oh, yes. I can't get enough pork roasts. My family, however, can. Would like to try this out sometime, though. That looks just wonderful. I am always looking for something with port and this looks perfect. WE love love love your blog and in honor of all the love we have awarded you the Versatile Blogger award. Come on over and pick up your award. We think you rock! I love Tasty Kitchen too! This rub looks so good. I'm glad you shared the recipe! Thanks!